Manaslu Circuit trek is among the exotic and off-the-beaten-trail in the Manaslu region of Nepal. This novel trek route is among the least explored route in Nepal. So, if you become a part of this round Manaslu trek you will get to enjoy the authenticity in everything. Nature, surrounding, people, mountains are crisp and pristine so Manaslu trek promises you the real flavor of the life on the lap of mountains. And USD 990 is the cost of Manaslu Circuit trek that promises you such unforgetting memories. Trekking in Manaslu region takes you to the heart of the Manaslu region. There you will walk to the Larkye La Pass as the highest point. And catch the most scenic views of Mt Manaslu, Nilgiri, Buddha Peak, Mt Hiunchuli and other snow-clad peaks. The towering peaks in the background of the most scenic glacial lakes, cascading rivers, waterfalls, along with the lush forests of rhododendrons, oaks, and firs are among the highlights of the trek. Further, the scattered settlements of the typical Nuri people in the Tibetan border adds beauty to the trek. Autumn and Spring are among the peak season for Manaslu Circuit trekking. These seasons have the most favorable temperature along with stable weather conditions. And, the crisp views is not to forget attraction during these seasons. But, if you prepare well and seek forward for extra adventure you can do this trek in summer and winter as well. Since Manaslu lies in the restricted region you cannot do Manaslu Circuit trek without a licensed guide. You must trek with a group of at least two trekkers excluding the trekking guides/porters/ porter-guides. Further to trek in this region, you need to get special permits (RAP, MCAP, ACAP) issued by the Nepal Tourism Board office or the TAAN office. Having said that, solo trekking in this region is not possible in this region. And you must be legally associated with a licensed company to obtain those necessary permits for Manaslu trek. Manaslu Circuit trek is a high altitude trek which starts from altitude as low as 700 meters at Seti Khola and ascends to the maximum altitude at Larkye La Pass, 5213 meters. To cover this altitude we have a 17-day itinerary around Manaslu Circuit where you will walk around 5-6 hours on the trail. This is a strenuous trek in the less crowded trails on the foot of Manaslu mountain. You will cover a distance of 177 km on foot starting from Seti Khola for almost 10/11 days. So, the rocky trails and the rugged landscapes plus the snow in high altitudes may add difficulty to Manaslu trek. But, if you proceed gradually and follow the instructions of your guides you can trek to Larky La Pass without many hurdles. And, the altitude may affect many trekkers in the trails if they challenge the altitude and ascend larger altitudes in a single day. But if you want to complete this trek successfully, you must ascend gradually. You must walk slow, maintain your pace and drink as much water as you can on the trail. Since hydration is a must to protect you from altitude sickness in the Manaslu trek. Although Manaslu region is a restricted and a remote region, there are enough teahouses along the route of Manaslu Circuit trek for food and accommodations. They offer basic services at quite reasonable prices. But do not expect sophisticated services at such a least developed region. Many people may doubt trekking in Manaslu region after 2015 Gorkha earthquake as the place was severely affected. But there is nothing to worry at all. The place is completely restored back to normal. New roads are finely constructed and managed by the Manaslu Conservation area. Also, the tea houses in the trails are newly made using the earthquake resistant technologies. So, the Manaslu Circuit trail is completely safe for trekking. Enjoy the scenic drive from Kathmandu to Arughat. You can do our 17 days Manaslu Circuit trek with an amount of USD 990 per person. This sum includes the cost of your necessary paper works, your cost of transportation, and the cost of permits. Alongside with the cost of food and accommodations, cost of guide and porters, all government charges and taxes. After paying you will get to trek in safer hands and get the most of the treks. If you choose to do Manaslu Circuit with us, then you will cover around 177 km during the whole trek where your starting point of the trek will be at Soti Khola. On this trek, you will walk for around 10/11 days on foot where you will cover around 15-20 km per day. This average distance per day depends on the toughness of the route. Sometimes if the route is easier with no steep slopes and rocky trails then you can easily cover long distances in a day. In general, you will walk for around 5-6 hours each day. This distance does not include the distance you will cover in the bus or jeep. This distance is the actual distance of your trek. So, the overall distance of the Manaslu Circuit Trek can vary depending on where do you wish to start the trek from, after the drive from Kathmandu. Also, during acclimatization days you can take short hikes around the hillsides. This is not included in the Manaslu Circuit Trek Distance. If you want to lengthen or shorten the distance of the trek, then contact us. We will plan the itinerary as per your convenience and promise to give you the best memories. A map is among the most important packing list during any treks or travels. They are your true companion and guide as they help you navigate the routes. Plus, with maps in your hand, you can get to know the name and information of everything new en route. They are your real guides everywhere, every time. Since Manaslu Circuit trek is less explored and novel trek route, a guide is a must for this trek because of various reasons. It will come in handy for your safety as well as for information. This trek starts and ends at Kathmandu. From Kathmandu, you drive to Seti Khola via Arughat and start trekking on foot. And walk for days on the trails of the Manaslu region. To get a detailed map of Manaslu Circuit, which includes both altitudes and the trek route, click here. Autumn (September - November) and Spring (March-May) is the peak season to trek in the Manaslu Circuit. These seasons are the most feasible times of the year. They have stable weather conditions and moderate temperatures. Autumn is the month of a deep blue sky with the clearest views. This season promises the most serene views of the rain-washed landscapes. Whereas Spring is the month of flowers- rhododendrons and Magnolia along with other wildflowers. In the trek route, you will experience the chilling blows of the wind under the warm sun. The trails are dry and cleared by the melting of the snow. So, you will have much pleasurable time during this time of the year. Summer trek to Manaslu region could be a daunting task as you may face the downpours and dense fog during the trek. Plus, there’s a high chance of leech-bites, earthworms, and other bugs on the trails. Plus, you may find the routes challenging due to rain. Yet, if you are fully prepared with appropriate rain gears, insect repellents, and comfortable trekking shoes with grip soles then summer trek is no problem. During the winter you will encounter heavy snow on the trails. Due to the cold and snow, the Larkye La Pass remains closed. But if you are well-clad in warm layers and carry warm backpacks then you can trek in other regions of the Manaslu Circuit trek. During the summer and winter, the weather and the temperature could make the trek difficult. But if you come prepared physically as well as mentally with proper packing then trekking in Manaslu Circuit is doable all year round. If you are free or depending on your convenience you do not have to wait for the peak seasons for the trek ie. spring or autumn. You can rather opt for this trek any time of the year. Manaslu Circuit is among the off-the -beaten-paths in the Manaslu region of Nepal. It is not as sophisticated as other popular trekking trails in Nepal. Plus, this is a strenuous grade trek. So, it demands much of your physical fitness as well as patients during the trek. You will have to walk for around 5-6 hours each day so the trek is going to be a big challenge to the novice trekkers. For such longer walks the rocky trails and the newly made roads and bridges after the earthquake could be challenging to you. Also, you will gradually climb to the highest altitude at 5,213 meters, Larkye La Pass. So, there are risks of altitude sickness during the trails. And, the changing mountain weather and the cold can add difficulty to your trek. Further, the winter or monsoon treks could add more challenge to the novice trekkers. And in nights you may feel cold in the tea houses. If you are an independent trekker and love to go on solo treks, then you may have to compromise your trekking dream. As you cannot trek solo in this region. But, if you take care of strengthening your stamina and patience, pack wisely according to the season you are trekking. And proceed gradually in the trek route, then you can overcome any challenges on the trail. Spring is among the best time of the year with the most pleasant weather and temperature around the Manaslu trekking trails. The days are among the bearable with no extreme cold nor hot weather. March, April, and May are the spring months in Nepal. This is the time when the harsh winter has ended and the pleasant days start to welcome the summer days. So, in this season you will experience moderate climate. Plus, there is the least chance of frequent weather changes during this time of the year. In Manaslu region, the whole region shines in rhododendron and other wildflowers. And the chirping sounds of birds in the jungle is sure you offer you a bliss after the sweating day walk. In March the temperature usually remains -6 degrees in the higher altitudes. Whereas in April and May the temperature starts to increase. So, the days start to get hotter with an average temperature of around 6 degree Celsius in the higher altitudes. The nights are chilly but bearable at the same time. And the precipitation is usually low during this season. So, you will get the clearest views of the mountains, and the landscapes along with the diverse vegetation all along the trek route. Autumn is the peak season for trekking in Nepal. It is the same for Manaslu Circuit trek as well. Late September, October, and November are the months of Autumn in the region. The weather and temperature remain the most favorable during this time of the year. Also, the weather in the high mountainous areas also remains quite stable than in other peak seasons. This is a dry season for trekking where you do not have to worry about rain or snow. You can trek freely with the basic packing. And, the precipitation is low in the region which means you get the sharpest views of the landscapes and the mountainscapes. In November the precipitation in the higher altitude remains around 3mm. So, you will get to enjoy the crisp views with no obstructions. Further, the temperature during Autumn trekking is the most favorable as it will neither be cold not too hot. You will get to enjoy the moderate temperature throughout the trail. During the month of October, the temperature usually remains 15 degrees Celsius in the lower altitudes. But as you ascend further the temperature starts to decrease and reaches around - 2-degree Celsius around the Larkye La Pass. This is among the favorable mountain temperature where you will have much easy time for trekking compared to other seasons. This is the season of festivals in Nepal. The major Nepalese festivals like Dashain and Tihar is in the autumn months. So trekking in this season means you get to become a part of the biggest Nepalese celebration. This trek has this bonus during your treks in the lower regions of the Manaslu Circuit. June, July and August are the summer months in the Manaslu Circuit trek. These are the hottest months in Nepal but the time of monsoon as well. Normally the days are hotter but during the evenings and nights, it usually rains. So, you can get the clearest views after the rainfall. During the June temperature in the lower regions of the Manaslu Circuit remains around 10 degrees in the higher altitudes. And, this season is the rainy season faces around 30mm rainfall at 4000 meters but as you ascend higher the rainfall decreases. This is the season where your rain gears and waterproof clothing come into use. This must be in your priority packing as you will be walking in the rain and the humid weather of Manaslu Circuit trek. Because of the rain and humid weather, you may encounter may bugs, leeches, and earthworms on the trail. So, if you trek during this time then you must pack insect repellents and table salt for your safety. The trails could turn slippery due to rain so you must walk slowly, use your trekking poles and proceed further. Plus, it is always a good idea to start early in the morning so that you can reach the tea houses before the evening rain gets you wet. Manaslu Circuit trek is the best option for botanists and ecologists as you will see every vegetation full of life on the trails. The lush forests and vegetation are sure to quench your heart and quest. December, January, and February are the winter months in Nepal. These are the season with the harsh winds and the coldest temperatures. And it is the time when the various flora and fauna go in hibernation. The temperature and weather in the lower altitudes of the trek are quite bearable despite the snow and cold. But as you ascend further in the foot of the mountains, you will experience the extreme cold, snow and blocked trails. In January the temperature in Samdo remains around -10 degree Celsius. Whereas the temperature around the Larkye La Pass drops to -20 degrees Celsius. So, the temperature could be much tougher for trekking in the Manaslu Circuit. And, due to the heavy snowfall, the passes in the higher altitudes may remain blocked. So, during your winter trek to Manaslu Circuit, you may not get to ascend to Larkya La Pass. Also, there are many chances of the snowstorms and blizzards in the higher altitudes. So, the winter trek is definitely going to be a great challenge because of the unpredictable weather conditions and the extreme temperatures. But, if you pack properly the warm clothes and build-up your stamina, this trek in winter is not impossible. Accommodations: Although this is a newly opened route, there are enough tea houses on the route for your best stay. They offer you a simple room yet a cozy one. However, the rooms are very basic with twin beds and a common toilet. And, during the peak seasons, you may not get extra blankets and may feel cold. If you travel during off seasons you may get the room for yourself. But during peak seasons you may need to share it your trekking partners. So, to keep safe a room for you pre-booking is a must. And, while pre-booking you will realize the importance of traveling with guides. Because they know about the routes, the services tea houses provide, and the price ranges. So, you will get good rooms at the best prices. Food: Most of the tea houses serve Nepali staple food “Dal- Bhat” along with the seasonal vegetables. They serve foods produced locally so, are organic as well. Since the route is not connected to easy transportation, the modern cuisines and continental dishes available at some tea houses are usually high in price. Also, the food choice gets limited as you ascend further. You get noodles, soup, chowmein, momos, tea and coffee in those tea houses. So, we recommend you to buy necessary chocolate bars, snacks at Kathmandu. The Gorkha Earthquake 2015 had the most devastating effect on the Manaslu Circuit trek. Because the epicenter of the earthquake was much closer to the trekking region, the place was seriously affected. Almost all the trekking trails either eroded or was blocked by landslides. Plus, most of the tea houses in the region faced a serious destruction. Many locals and the trekkers on the trails lost their lives. The region was restored, rebuilt after by the end of 2017 so it is now safe to trek in this region. You have lesser risks of the aftermaths of the earthquake in the region. The locals have rebuilt the tea houses applying the earthquake resistant technologies. And, the number of the teahouses is also increased in the routes. So, you do not have to worry about your safety or about finding the place to stay after the day-long walk. New roads are constructed and well-managed with different road signs which will help you navigate the trails without any dangers. So, Manaslu Circuit trek is completely safe after the 2015 Earthquake with all the trekking infrastructures made and restored. In this strenuous Manaslu Circuit trails, you will walk up to the largest height at Larkye La Pass in the altitude of 5213 meters. As you will be ascending to the higher altitude for longer days in the rugged trails of the Manaslu region. So, there are many chances that you suffer from altitude sickness. You may face many symptoms like a headache, nausea, shortness of breath and lethargy with sleepless nights. If you feel such difficulties during the trek, you must immediately inform your guide and stop ascending further. You must take enough rest and check for your health improvements before you ascend further. In severe cases, you may take medicines but under the supervision of your guides or medical practitioners only. Or in extreme sickness, you may need immediate medical evacuations. For such serious cases, your travel insurance plays an important role. Altitude sickness is not to be ignored factor while trekking in the higher altitudes and for a longer duration. But you can minimize the risk by maintaining body hydration, avoiding alcohol, and ascending gradually. Manaslu region is a land of Nuri people, the descendants of Tibetan Buddhists. So, most of the activities, culture, and way of living of these people have a high influence on Tibetans. And the monasteries, chortens along with the flapping prayer flags reflects how the age-old Tibetan practices and celebrations still exist in the region. As you proceed further towards the Tibetan border sides, you will experience much of their lifestyles. They are the living history of antique Buddhist practices. And are ethnic groups who are unique in themselves. Their life is least affected by the modern lifestyles, so during your trekking, you will experience the authentic life of Nuri people. Also, if you make time to do a side trip to the Tsum Valley then your experience intensifies. You will enter the lesser known and least explored plus, the typical hillside settlements least affected by modernity. The people are still connected to Tibet for trade activities because of the close border to Tibet. Along with it, you get to walk through the diverse yak pastures and the farms of the local people. Farming and trading are the popular activities the people of this region are involved in. So, while you trek in the region you do not only walk in the region. But you get to explore the lifestyle of the Himalayan-side people. And become a part of their happiness and local Buddhist celebrations. Solo Trek to Manaslu. Is it Possible? Solo trekking is possible only if the trekking region is not a restricted region. Manaslu Circuit trek is a restricted region you cannot do solo trekking unlike other treks in Nepal. The Government of Nepal and TAAN has made regulations for trekking in the restricted region. According to the rule, you must travel with at least two people excluding the trek guide. But if you do not want others to join you can opt for a “ghost permit” with which you can walk with your guide only. You do not have to worry about arranging the group. Manaslu region is among the restricted region in Nepal. You need to abide by special rules and regulations before trekking into this region. While trekking around the Manaslu Circuit you will enter Manaslu Conservation Area as well as Annapurna Conservation Area. USD 50 from December- August per person per week. Whereas USD 7 per person per day after the first 7 days. USD 35 for first 8 days from September - November. USD 25 for first 8 days from December - August. Permits are mandatory documents you need to carry along while traveling to any parts of Nepal. It is to keep a record of your safety. As well as to collect money for the conservation, maintenance, and restoration of the trekking trails. You can collect these permits from different places. Department of Immigration Nepal for the Restricted Area Trekking permit. Nepal Tourism Board, Kathmandu/Pokhara or TAAN office for the MCAP and ACAP permits. Or, you can also collect these permits in the trailheads. But the cost may be a bit high than you buy them at Kathmandu or Pokhara. However, if you trek in these regions without permits then you will get punishments as per the law and you may have to pay fines as well. And, get them at trek head with a penalty. As mentioned earlier, you cannot do solo trekking in the Manaslu region you must hire a licensed guide or porter for the trek. Or, you can hire a licensed porter-guide who will guide you along the trek as well as help carry your backpacks. Many trekkers opt for Porter-guide to control their expenditure on the trek. There are many perks of hiring guides for this trek. Since the trail route is novel with millions of flora and fauna, guides will supply the necessary information on the route. They will introduce you to the local communities, ethnic groups, their culture, and traditions. To hire a guide, you need to pay around USD 20- 25 along with the cost of their food and accommodation. Whereas, if you hire a porter, it costs around USD 15-20 per day exclusive of their cost of food and accommodations. But if you want to control your budget, then you have another option as well ie. porter- guide. Porter-guides are cheaper than hiring both guides and porter. Plus, they help carry your load and guide you throughout the route as well. They generally charge USD 18- 20 per day. But, before you hire a guide/ porter/ porter-guide check properly if they hold trekking license or not. And, it is good to know them before the actual trek. This is among the remote treks in Manaslu region of Nepal, so do not over expect about the food and accommodations on the trek. You will find basic services everywhere on the trip except at Kathmandu. Since you will find lesser crowds trekking in this region, do not leave your group. There are high chances that you lose the trails as it is among off-the-beaten-trails in Nepal. Dehydration increases lethargy and makes you weaker. Also, it increases the chance of altitude sickness. So, drink enough water and soup in the route to maintain body hydration. Buying water bottle throughout the trail could rocket your trek budget. So, it is good to pack water purifiers or purification tablets before you leave. This way you can refill your bottle with the local taps and make it drinkable by using purifiers. If you are doing the trek in monsoon, do not forget to carry along table salts or insect repellents. They are the most to keep yourself safe from bugs, leeches, and mosquitoes in the lower altitudes of the trek. Pack lightly! Pack Wisely! First, do a detailed research on the weather and climatic condition of the trail during the time of the trek and pack accordingly. Over-packing with unnecessary loads is only a burden on your trek. Always keep the permits handy. There are many checkpoints in the route where you have to verify your permits for trekking in the region. Get a travel insurance before you come trekking in Nepal. Trekking to the high altitudes and mountains is adventurous and dangerous at the same time. You may fall sick or may suffer from altitude while trekking. For such conditions, you may need immediate medical evacuations. So, before you buy a policy make sure that your travel insurance covers up to the height of 6000 meters and immediate helicopter evacuations. As you ascend higher, the number of tea houses on the route also decreases. So, while trekking it is better to pre-book the rooms before you leave for the destination. Do not skip acclimatization days from the trip. You must not ascend to highest altitudes in a single day. You must proceed gradually and allow your body to adapt to the changing environment and thin air. Manaslu Circuit trek takes you to the forbidden yet exotic lands full of the natural and cultural diversity. This 17 days trek is sure you offer you the memory of a lifetime in an amount of USD 990. So, why not join this trip with Sublime trails. We promise to make the trek memorable also we are happy to customize the trip according to your preferences. So, drop us a mail to book your trip or for any inquiries. Our representatives will be at the airport to pick you up and take you to the hotel. You will need to rest after a long and tiring flight. 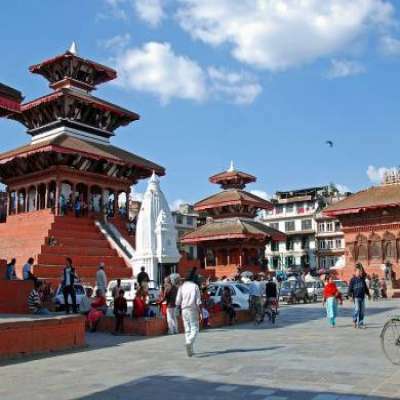 Later in the evening, you will enjoy the vibrant tourist known as Thamel, which is located in Kathmandu. Enjoy the food and you will be staying at a 3-Star hotel in Kathmandu. On the second day of the trek, we will head to Soti Khola. It is a total of 8 hours drive and as we pass through Arughat. You can enjoy the bus ride as it offers you the view of village fields and farmlands along with a picturesque scenery of terraced farm fields. We will find pitched road up to Dhading Besi and then it turns off-road after that. Off-road is an indication that we are reaching the remote areas of this region. After driving a total of 8 hours, we will finally reach Soti Khola. We will spend the night in Soti Khola which is located at an altitude of 700 meters. The trekking on this day does not demand much physically. There will be few moderate climbs as we head out from Soti Khola. We will walk past a forest trail and will encounter many suspension bridges. We will come across several pasture lands and fields on the edge of the forest trails. After walking for about 5-6 hours, we will finally reach Machhikhola where we will rest for the night at a humble guesthouse. On the fourth day of the trek, we will be crossing the 1000 meters mark and reach a total of 1330 meters in altitude. We will head through forest trails and small settlements which are occupied by ethnic groups. The highlight of this day is that before we head to Yaru Khola we will enjoy the natural hot springs. We can spend some quality time here, relaxing our muscles after a long day of walk and helping our body recuperate to carry on for the rest of the days. The locals believe that these hot springs have the capacity to rejuvenate your body as the water of these hot springs have minerals. We will spend the night in Yaru Khola. We will go easy this day as we will just be walking for a total of 4 hours. We will head to Philim after our breakfast. The landscape of the region will still be the same as we walk through the forest trail. We will also come across few suspension bridges while we are on our way to Philim. It will get a bit colder and we will also be crossing the 1500 meters mark as Philim is located at an altitude of 1590 meters. We will spend the night in Philim. On this day we will head to Bhim Phedi. There will be occasional climbs coupled with downhill paths. It gets a bit tricky at times but it is all part of the trek. We will pass through some sensational waterfalls and our trail will also take us to Eklebatti village which is quite a popular stop for tourists. After walking for about 5-6 hours, we will finally reach Bhim Phedi(2130 meters) where we spend the night at a guesthouse and take a well-deserved break. On the seventh day of the trek, we will be crossing the 2500 meters mark as we reach Namrung which is located at an altitude of 2660 meters. On our way to Namrung, we will come across spectacular trails that will give an idea about the things to come and how exciting and challenging this trek is going to be. We will also cross several villages in which the ethnic group called the Gurungs live. There are a few gompas and monasteries in this region. You will realize how naturally and culturally beautiful this region is. We will walk a total of 5-6 hours on this day. The trail now becomes more challenging as we head towards the 3500 meters mark. On this day the increase in altitude will be about 900 meters, quite challenging but we will also be able to see Mount Manaslu which will be a treat after about 6 hours of walking. Samagoan is quite popular simply for being the stop where you can have an unobstructed view of the mountains. Samagaon is situated at an elevation of 3530 meters. This naturally blessed place would be a perfect spot for trekkers to spend the night. On the 9th day, we will take rest in Samagaon. We need to let our body relax after the number of days we have walked. We should also rest because we need to let our body acclimatize to the thinning air. This will help us avoid altitude sickness which can be quite dangerous. We can have a short hike up to Birendra Lake. You can also opt to explore other parts of this village and interact with the locals. We spend the night in Samagaon. You can wake up early in the morning to catch a view of Mount Manaslu in all its beauty. We will then leave for Samdo. This trail from Samagaon to Samdo is fairly easy. We will come across vast pasture lands where yaks graze. We will also be able to catch the view of other mountains. 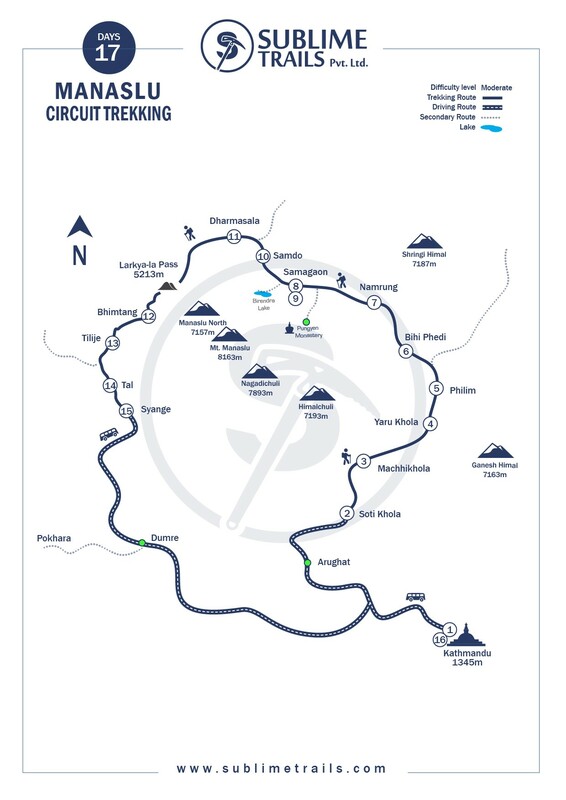 We will walk a total of 3-4 hours and will rest in Samdo which is at an altitude of 3690 meters. On the eleventh day of the trek, we will cross the 4000 meters mark and reach a total of 4470 meters when we reach Dharamsala. The trail to Dharmasala is beautiful and you will be accompanied by the spectacular view of the mountain ranges. Dharamsala was an important trading village but now it is very quiet here. Now it has become a stop for trekker who wants to cross the sensational Larke La Pass. On this day we prepare ourselves for the cross of Larke La Pass. we go to bed early so we can leave early next morning. This day is the most important day of our trek. We will be crossing the Larke La Pass which is the highlight of the trek. This legendary pass boasts an altitude of 5213 meters. It is quite challenging but a rewarding experience. We will be witnessing some spectacular view of the mountains such as Himlung, Annapurna II, Cheo Manaslu among others. After crossing the majestic pass we will head to Bhimthang which is located at an altitude of 3750 meters. On this day we will walk a total of 6-7 hours. On this day we will take a downhill trail and so the altitude decreases. We will pass through trails that are laden with rhododendron forests. The trail will again take us through farmlands and small villages until we get to Tilje. Tilje is located at an altitude of 2310 meters so the altitude we descend on this day is 1440 meters. We will spend the night in Tilje after walking a total of 5 hours. On this day we will head to Taal. the trail gets simpler and less challenging. We will come across few spectacular waterfalls. We will also come across few small settlements. After about 4 hours of walking, we will reach Tal which is located at an altitude of 1700 meters. The decline in altitude continues as we head to Syange. We will now be walking on the trail of another famous trekking route - Annapurna Circuit trek. This will be the final day of trekking for us. We will walk a total of 4 hours this day. We will rest for the night in Syange and try the local cuisine. On this day, make sure you mingle with your trekking crew members and thank them for the support. Syange is located at an altitude of 1175 meters. We head back to Kathmandu on this day. The bus ride will be about 9 hours. We spend the night in Kathmandu and go around Thamel which is tourist hub in Kathmandu and enjoy the night. Day 17: Guides you for your final flight departure home or may be your next destination. Time to head back to your home and share your wonderful experience in Nepal with your family and friends. Also, if you decide to extend your stay in Nepal, you can inform us. We at Sublime trails would be honored to be at your service. We provide various tour services. If you also want to trek in another region, we would be happy to guide you. Pick up and drive from airport. Accommodation for two nights in Kathmandu including breakfast. Your standard meals-Breakfast, Lunch and Dinner- during the trek. Transportation by bus Kathmandu-Arughat and Syange-Kathmandu. All necessary paper works, conservation entry permits and restricted area permit. Sleeping bag, down jackets and trekking map, if necessary. These items should be returned to Sublime Trails after the trek. Rescue & travel insurance, trip cancellation costs, accident or health emergency, evacuation, loss, theft or damage to baggage and personal effects. We strongly advise you to get a personal travel insurance. All alcoholic and nonalcoholic drinks and Drinking water during the trip. Your entry visa fee to Nepal. The itinerary that Sublime Trails, namely Ram and his team of Porters provided were all that I ever wanted to explore in - trekking on the snowy mountain, homestay on the mountain, visiting Buddhist monasteries, learning the living culture of a Nepal! Being an amateur and a really slow trekker, it was raining and dark on the snowy mountain, I was in awe of appreciation when I saw the Porters walked on the edge of the cold mountain for my best safety!! Every day was ended with a hot bath and a warm dinner in a cozy dining hall...very warm hospitality from the Nepalese indeed! Most of the meals were meat-less, But! Not to worry for meat lovers like me as the resourceful Ram would have a way with all your needs, definitely. We couldn't have completed the 14 days Manaslu trek of the mountain beyond mountain with great Himalayan views without Ram and his Porters, providing 101% of their expertise, patience, commitment and their singing of the Nepalese songs! Thanks, Sublime Trails Team! Overall, my experience with Sublime trails was Fantastic. I went to Manaslu trekking in October 2016 with my two friends, where I had a fantastic experience. The whole sublime team were really helpful and flexible in organizing, managing a trip. they are really friendly, resourceful and competent. Special thanks to Mr Ram a manager, Mr Shiva a guide and porters. Hope to see you again guys. This is Scheduled departure dates and joining for permit sharing Because for Manaslu region solo traveler cannot issue the entry permit. If you are more than 2 people please Contact us, we always operate your trip.